Following the trail from the recently-demolished house at 1951 St. Louis Avenue, let’s examine the rest of the block two years ago. Here were the thee buildings east of that house. At the left, see a very stately Italianate single-family home. 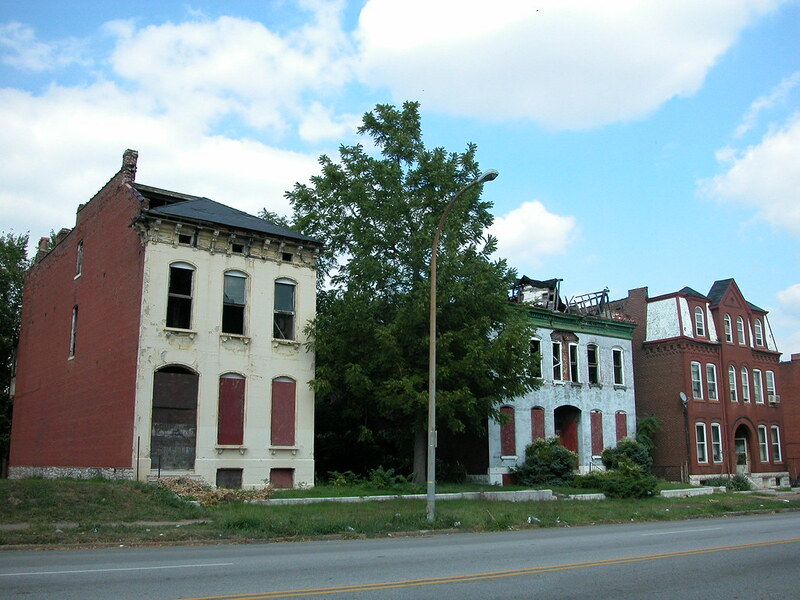 In the center is a brick tenement, with thew front wall painted and a likely mansard roof destroyed by fire; this building was razed in 2007. 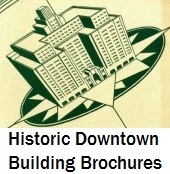 Both buildings were owned by the city’s Land Reutilization Authority. These represent common styles and forms for the 1880s. The building at the right is an apartment building that is occupied to this day. This building demonstrates the near north side architectural sensibility of the 1890s — the mansard roof form remains, but it is divided by a prominent brick dormer. The cornice is brick, not wood, and the entrance is formed by a generously wide Roman arch. 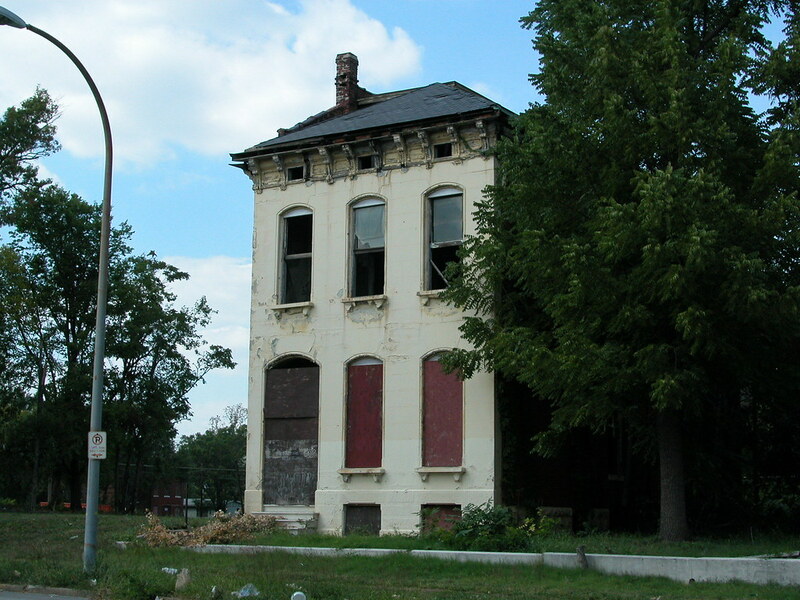 The Italianate home today stands vacant, and the east wall of the rear ell is starting to lose bricks fast. 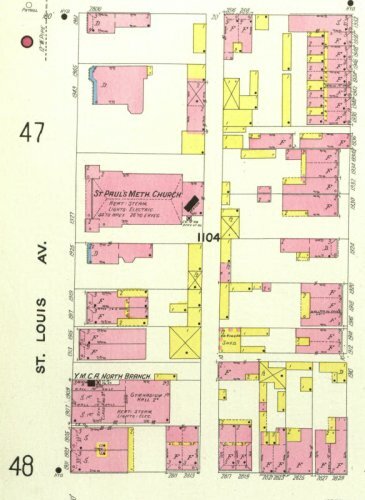 A 1909 Sanborn fire insurance map shows eight buildings on this (north) side of the 1900 block of St. Louis Avenue. Three of these, long gone, were large buildings. Just west of Fleetwood’s stood the North Branch of the Young Men’s Christian Association. Between the house at the other corner and that Italianate house were St. Paul’s Methodist Episcopal Church and a large mansion enjoying a generous side yard between it and the church. The 1964 Sanborn fire insurance map shows that the North Branch and the mansion were gone. The Romanesque Revival St. Paul’s, which had been built in 1902 and designed by Matthews & Clarke, survived until 1998 when it was senselessly demolished by its owner (LRA). Last year, all of the remaining buildings on the north side of this block (across the alley) were decimated by brick thieves operating with rapacious precision. This spring, those damaged buildings came down. What does the future hold for this block? The Italianate house seems destined for demolition next. (May that not be the case.) The apartment building and Fleetwood’s, though, are going to be around for a long time to come. What fills in around them is anyone’s guess. Will it be new homes or shops that express the sense of place that the fallen buildings did? That depends on what our sense of this place is when we building — or, more likely, the sense of who does the building and who delivers a vision for rebuilding St. Louis Place to that builder. It’s easy to shudder at the prospect. 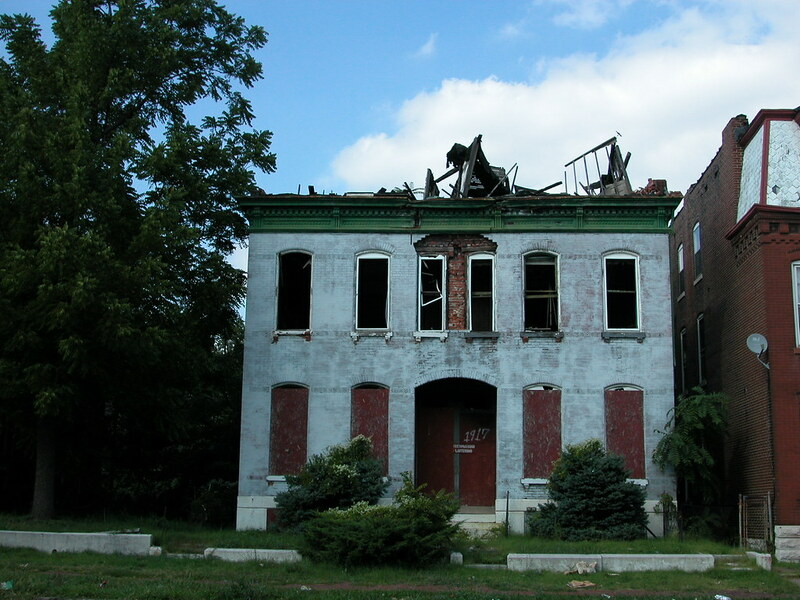 After all, the current sense of St. Louis Place held by many is confused and beneath the dignity of the neighborhood’s generations of residents, past and present. Once a certain sense emerges, rebuilding will lead to a block face as engaged in the values of its age as this block face once was. Although we have seen tragic loss of this block, let us not neglect to lay out the blueprints for a rebuilding that will honor our heritage. 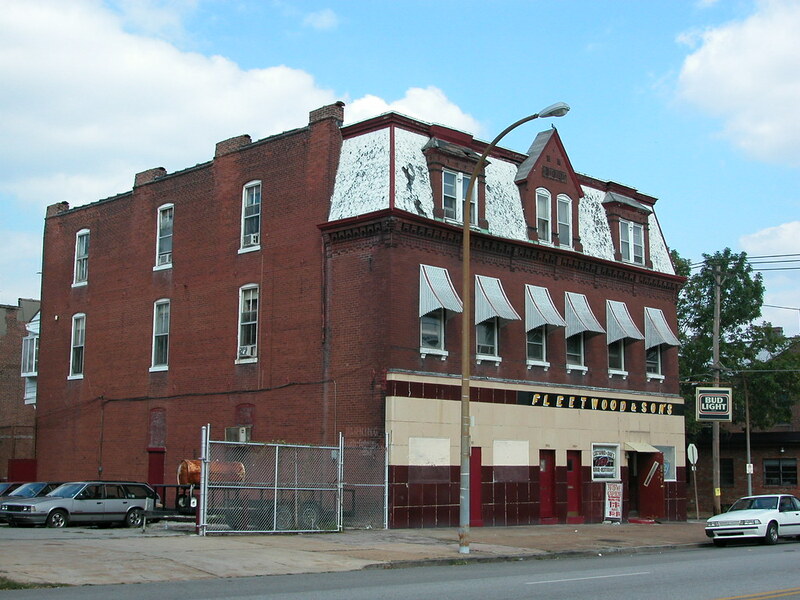 This entry was posted in Architecture, Historic Preservation, LRA, North St. Louis, St. Louis Place. Bookmark the permalink.